The Lucky Dog Jumbo dummy is the bigger version of our popular LD regular dummy. They are perfect if you prefer a soft yet durable knobby dummy. I have used them for years with my dogs and they hold up great. We include a dummy rope so you can throw them further. This "jumbo" dummy has a 3 inch diameter it is recommended for bigger, older dogs that can handle the size. It is perfect for beginning the transition from "regular" 2 inch dummies to the next step -- actual ducks. White is an easy color for young dogs to see against most dark backgrounds and on water. Perfect for regular "marks." The valve allows you to add water to your dummy to give it more weight. This allows you to throw it further and it makes it sit lower in the water. I strongly recommend that you test them before adding any water. If you over do it, they will sink to the bottom. Test them in your sink or in shallow water first! The Lucky Dog jumbo dummy. It is 3x11. Like all of our dummies at Gun Dog Supply, it comes with a free throw rope already attached, ready to go. Got your water valve. The idea behind the water valve is it allows you to add weight to the dummy. You fill this up with water. What it does is when the dummy hits the water it is going to sink a little bit more so it makes it harder to see. Gotta be real careful about that. If you overfill it, it's going to sink to the bottom. So you want to test that in shallow water or a tub to make sure you get your weights right if you are going to do that. You've got the body of the dummy which has the knobs on it. This is a soft knobby dummy is how we refer to it. it makes it easier for the dog to pick up when it's slick. White is the easiest color for a dog to see in most situations. We prefer those for young dogs. Six months and up on a good size dog is going to work on these. I like the three inch dummy a little bit better than a regular two inch dummy just because it gets the dog used to picking up something that's a little more duck or pheasant size in their mouth. The white is easiest to see in most situations for a dog in a dark background. It's going to show up really well. Orange is a very difficult color for dogs to see. It blends into most backgrounds and it makes it really hard for them to see. We use these for blind retrieves. It makes it easy for you to see the dummy so you know where it is, but the dog has a hard time seeing it and he relies on you with hand signals to tell him where he's supposed to go to find the dummy. My favorite of the three is going to be the half black/half white. The contrast between the two colors in the sky is going to stand out for the dog better. He's going to be able to see it better in the sky. In a light sky it's going to show up better with the black. When it hits the ground or the water, depending on what kind of background you have that day, either color is going to stand out better. Light background you will have the black. In a dark background you will have the white. So, from a marking standpoint, this is really the dummy that I'm going to go for. GREAT! Not too hard and gets my young dog used to bringing back a large mouth full of bird, bumper, etc. 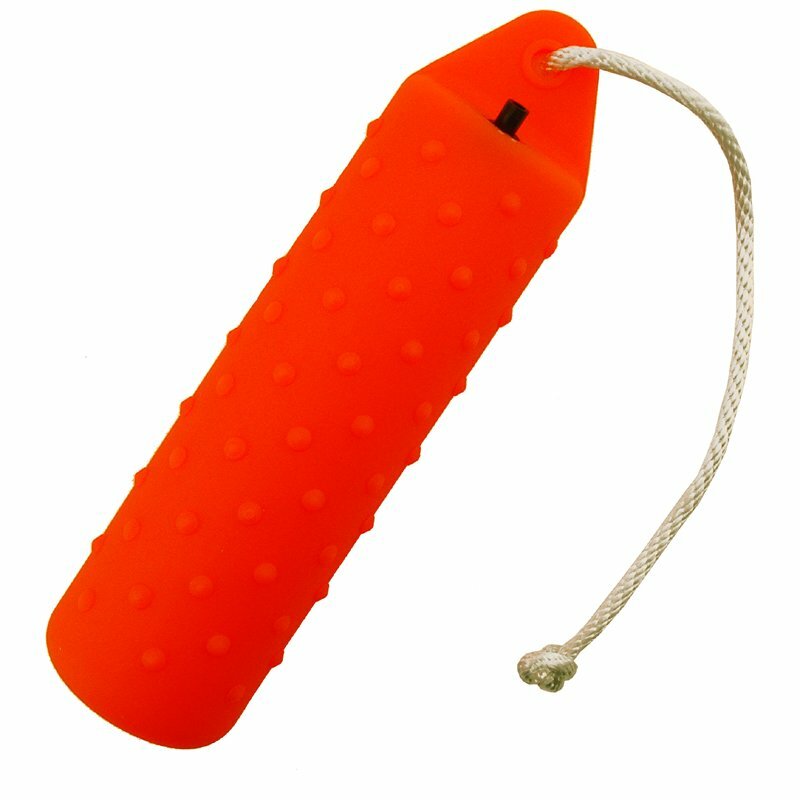 Well made and durable product, helps dog develop good holding technique, and the throw rope GDS supplies with each dummy is great! My order came in record time and was EXACTLY what I wanted. I've been using the smaller diameter versions, but now that Bruce is full grown, it was time to move up to big boy bumpers. Product was great, but not as great as your service. I rec'd these 2 days after ordering!! Thanks. Ordered several times. Great company with fast shipping and great products. I ordered these bumpers for my new lab that will be competing this year. Great product, durable at a good price. Great service from GUN DOG SUPPLY. Product is just as ordered, great price and exceptionally quick delivery time. I will surely order from Gun Dog Supply again. So far so good. We'll see how the valves hold up throughout the year though. I'm a little skeptical, but at that price you can't go wrong. Dogs love them. Bought some peppy ones before, and they hold up well. I like dealing with this company. Very durable. My dog has a tendency to gnaw on the dummy during retrieves, and the dummy shows no signs of any damage. My last dummy lasted 2 years of daily use and finally showed a 2 in split in the body. Still floated and continued to use it another 6 mo. Solid product. They are exactly as advertised. Works great for mature retrievers. The standard size is good for young and mature dog and a little easier to throw. The rope is high quality. Both dogs love them. Check Facebook for recent photo. Durable, Visible, and Heavy enough to throw far easily. Good in all terrain: Land or water. They eventually wear and crack, but will still float and their usable life can be prolonged with Duct tape. The attached throwing rope is long enough to be practical. Our 2 Goldie's love their orange dummy. I was losing faith in my female's retrieving abilities as she showed no interest in retrieving balls or sticks. Since the dummy arrived she has been the retriever I hoped she would be. Absolutely loves it! Great training bumpers! Helps build confidence in the dog. Keeps him looking out and pushing forward. "If I can buy from you, I always will!" You guys are the best. If I can buy from you, I always will! "Dependable bumper that hold up to professional use." Dependable bumper that hold up to professional use. Love the included ropes. The valve really helps change the way the bumper sits in the water. They are my go to vinyl bumper. "I don't bother with other bumper brands any more." I have tried different brands of bumpers but Lucky Dog is definitely the best. They have out lasted all the others, and I don't bother with other bumper brands any more. Your service was great. You called to let us know the decoy was back ordered. Excellent. Throws well. The weight can be varied to suit. Sturdy and economical. "My dog likes the small knobs and the softness." My dog likes the small knobs and the softness. I have another brand with big hard knobs he does not like. Thank you. I'll tell you what, you won't be disappointed in these bumpers! I ordered 10 jumbos and 20 of the regular size and they are holding up very well and I don't see any issues arising. I do a lot of T drills and having enough bumpers makes it even better! Great quality and durability! Good stuff. Nice and heavy, and relatively easy to transition to from standard bumpers. Seems pretty durable, and easy to clean. I love these jumbo size bumpers, better yet my dog Rex loves them. I like the extra heft to them, similar to the weight of a duck. I haven't used it yet but it looks perfect. These dummies are just what I need. Inexpensive to allow me to have plenty on hand for any kind of drill with multiple dogs, but good quality that lasts for years. I have bought these before, and would recommend them to anyone who is interested in buying bumpers for their dogs. Great product... Good training tool!!! Works well. I use them almost every day, and sometimes even twice a day. The jumbo bumpers have been great. They help teach my dog to open his mouth bigger and hold bumpers in the middle. Also have helped with long distance blinds, cause he can see them from farther off. These bumpers always exhibit a consistent quality. Jumbo orange works great with some drills. Especially walking baseball, where the handler needs to keep track of where the bumper is. Great quality product. I recommend to everyone that owns a dog and hunts waterfowl to use these bumpers for training and working. Great product! No problems at all. Great bumpers. Perfect size going up from the smaller ones. Good value for the low price. The bumper works great, good for retrieving exercises. Highly recommend the use of the bumpers. These buoys throw well, float well, take months more abuse than any canvas buoy I have found, and they are very affordable. Great buy either for dogs you are working up to carrying duck sized objects (and, God willing, ducks) or as a daily play toy for obsessed retrievers. Bang for your buck. The best bumpers you can buy. Durable product for training on water and in the field for the price. We buy them in bulk if we can. Silver Dog Outdoors retriever training. These are the softest dummies that I have found. I just need to work on my labs to have softer mouths and not to rip them up. Love the knobby and so does my Golden! It makes retreiving so much better. The throw ropes are awesome! Good quality, and the soft plastic is helping my dog learn good holds. "The pre-tied throwing ropes make these great." Nice and soft yet tough enough. The pre-tied throwing ropes make these great. These will last a long time unless you have two competitive labs who play tug-a-war. I have purchased these before, and they are excellent. I have a young lab at 5 months old, and these bumpers are very nice with the valve to release some air out to make it easy to pick up. Thank you. Excellent product. I use it for yard toy with my German Shepherd. It last pretty good. They work great for Wagon Wheel. Labrador Revreiver. Hunts. Family pet. Shipped quickly. Ropes already attached. Ready to go train with right out of the box. Excellent product and service. yes, the bumper is great, as is everything i get from gun dog supply, and great personal advice, too. "Very durable, good weight, and easy on my dogs mouth." These dummies work well. Very durable, good weight, and easy on my dogs mouth. He loves them. They're his favorite. Very durable. I don't know if you could make a better one. "Our Chessies love retrieving these !" These dummies are very tough and made of thick puncture proof materially. Our Chessies love retrieving these ! Rope could be a little thicker. "My black Lab Rock, LOVES IT!" I love it. My black Lab Rock, LOVES IT!!! And so do all his dog pals!!! This is the soft decoy! LOVE, LOVE IT!! "No one else can hold a candle to these guys!" Hands down these are the best bumpers around...superb quality. GDS offers the best pricing AND provides the best throw ropes on every bumper sold. No one else can hold a candle to these guys! "Best buy for the buck"
"Excellent product, easy to pickup"
I have about 20 of these for use in retriever training. Excellent product, easy to pickup, heavier than smaller diameter bumper for added training. Chesapeake Bay Retriever,German Shorthair Pointer. Beagle. Hunts. Family pet. "Very happy with the product." Springer spaniel. Hunts. Family pet. Durable rubber bumpers. Soft enough to give a firm hold. Nice size to get ready for pheasants. Good product, Good Price and Fast Service. Good quality and good price. Just what I was looking for. "GDS can be counted on for quality products at a great price." GDS can be counted on for quality products at a great price. This bumper is no exception. GDS is the go to for gun dog supplies. "It is a great help in going from small dummies to large one." It is a great help in going from small dummies to large one. More like the size of a duck. Big help with fetch and hold problems. Great products and delivered as promised. They're great. My basset/rottweiler needed a tough toy of his own and is learning to retrieve. He bit out the water plugs. I only use it on land not in water. I won't share any more with other dogs because they chewed off the rope when I wasn't looking. Good product. Time will tell how they hold up. "Good quality and a great price." "These dummies have held up well." These dummies have held up well. Bought these for gun dog sweeps competition. Hope the winners like them. How could they not? They're top quality bumpers!! That's all I buy. Nice product. "Perfect for my soft mouth dog." These are great bumpers, once the plastic smells dissipates (doesn't take long if left in the open). They aren't super hard or soft like some other bumpers. Perfect for my soft mouth dog. "I will be adding more to my collection of training bumpers." These are great and for the price. I will be adding more to my collection of training bumpers. The rope should be a little thicker & the knots a little larger. "Best price I've found! " "Its holding up well and my dog marks it very easily!" Its holding up well and my dog marks it very easily! I got 3 orange and one flasher. They came very fast. The cords on them are the perfect length. The bumpers are pretty stiff, they seem like they will last a long time. They are slightly heavier and they throw further than Avery sport dog bumpers. Overall, very happy with the product. Great, rugged, jumbo dummy. Only issue I had was getting the valve to seal - water leaked out. Use to train a solid Hold, as dog had a little butter-mouth last season. So, I fill them with water, and make her hold during obedience training, and fitness runs. Leaky valve not a major problem, and dummies do great in the water. They work great except for the valves. If you have a hard mouth dog, the valves will fly off like a rocket, then the bumpers are restricted to land use only. I have looked to purchase more valves, but you guys do not sell them. Cannot keep the air/water valve from coming out. You sent me extra valves to replace the lost one, but I have found no product to glue them in place. These were purchased for a friend per his request not for my training use. Generally, my whole order was too expensive after adding extra costs for shipping $50+ and duty at customs $27+ ... not to mention rate exchange ... I'll need to figure out another way of shipping merchandise to US friends instead. Products and delivery service all good. Good dummy for good price. Durable, thicker diameter ropes would make throwing easier. My dog loves it, but it is already cracked from her biting it. I had wanted the hard one, but you were out of stock when I ordered, so I went with this one. If I had a puppy that I was training to hunt and retrieve, this would have been a terrific item. My dog is a heavy chewer and had the toy completely chewed up into little pieces in a week. I had bought 3 of them and am saving the other 2 for when she matures and hopefully stops chewing her toys. This lasted longer than the stuffed bird from the tractor store which was destroyed in 5 hours. Good news, having toys like these keeps her from chewing on our shoes and furniture, etc. Overall a good buy. Like that they come with throw ropes. I like that you can add and take away air for higher and lower float. Seems like they are durable but only time will tell. Just started using these. Good bumpers. Harder/stiffer plastic which has been good for treating mouthing. Good product at a great price. I've used Neumann and Bennetts for 30 years. They are the best. However, since they are hard to get, I bought the Lucky Dog's bumper. They work just fine. I prefer products made in the USA. I just can't help it. Otherwise I might have given them 5 stars. I got 12 large ones and 12 small ones. The small ones were great. The large ones were a little hard. First of all it only took one throw for the valve stopper to fall out and disappear. My dog chewed the neck holding the throw rope off in about 2 minutes. Air valve fell out after 8 throws. Check valve popped out of them. I will replace them will new ones next week. Perfect if you prefer a soft yet durable knobby dummy -- Free Throw Rope Included!